Signed “Arnold Genthe S.F.”, in pen on the photograph, recto. (The “S.F.” notation verifies this is a vintage print, made in the years after 1906 before Genthe departed for New York.) Mounted to card and trimmed. The view is from Franklin St. near Sutter, looking towards Nob Hill. 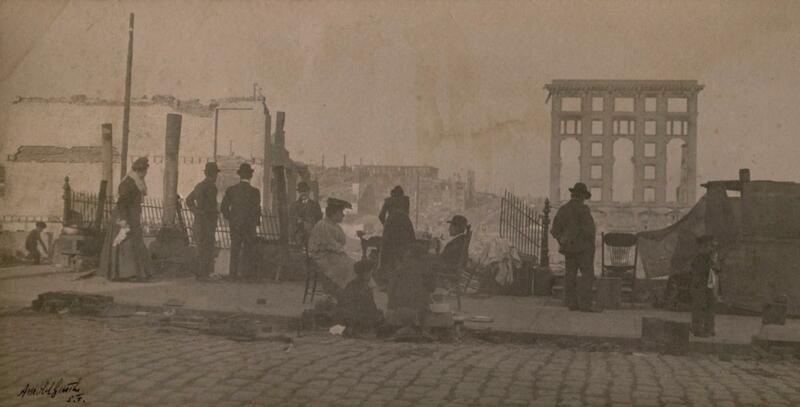 One of Genthe’s better known images from the period following the 1906 earthquake in San Francisco, this photograph reflects both the horror and the prevailing spirit of the survivors. The ruins of the Fairmont Hotel on Nob Hill can be seen in the distance. A print of this image is held in the collection of The California Historical Soceity; the negative is owned by the Fine Arts Museums of San Francisco, Achebach Foundatin. Arnold Genthe (1869-1942) came to America in 1895. His early photographs focused on San Francisco’s Chinatown district, where Genthe would use a concealed camera to capture the natural flow of life there. After loosing all of his equipment to the San Francisco Earthquake of 1906, Genthe borrowed a camera and documented San Francisco’s devastated buildings, raging fire, and shocked survivors. Moving to New York City in 1911, Genthe continued to make photographs, particularly of dancers, actors and other celebrities, often in a soft-focus, pictorial style. Items Similar To "Arnold Genthe: Refugees after the Quake, 1906"